Google’s collection of personal user data has been controversial for quite some time, especially in the wake of the NSA spying revelations which involved the company. 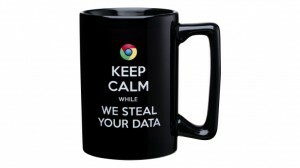 Microsoft is capitalizing on this new-found flaw with Google’s services by launching a line of “Scroogled” products. These products range from T-Shirts to coffee mugs. The Scroogled term was coined by Microsoft and is now being used in a national campaign of sorts. While it may not be much of a “professional” move considering that Microsoft surely has its own issues, the Scroogled products are already catching on. Of course, anti-Google people or Microsoft fan-boys are in love with the new line of products but the average person seems to responding to the launch in a negative way. All in all, most people seem to think that it is either funny or completely childish. Some people do not even mind that Google tracks what its users are doing. In some people’s minds, that tracking has resulted in better free services coming out from Google, instead of some of the sub-par and costly ones from Microsoft. Services such as Google Now rely on tracking user input on other Google products in order to provide any information at all. According to Microsoft, this type of anti-Google marketing and in particular, the Scroogled line, is working. This does not seem to be the truth considering that practically every article regarding the new products is criticizing Microsoft for them. Plus, Microsoft’s Bing search engine is still sitting around 15% of the market, whereas Google dominates the entire search industry.